Muhammad Zubair (left), an assistant professor at National University of Sciences and Technology, worked in Arizona State University Associate Professor Tae-Woo Lee’s lab during the spring 2018 semester. Zubair is co-principal investigator on two joint USPCASE research projects: Development of Hybrid Micro Combined Heat and Power System for Distributed Generation in Pakistan, with Brian Fronk of Oregon State University, and Energy Efficiency and Sustainability in Building Sector of Pakistan with Arizona State University Professor Harvey Bryan. Photographer: Marco-Alexis Chaira/ASU. A lack of sustainable energy sources in far-flung underdeveloped regions is among the most daunting roadblocks to quality of life still plaguing much of the world. 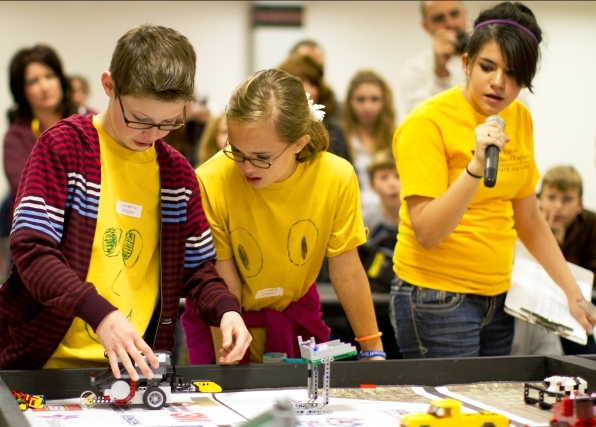 The challenge is not only technological — requiring advances in engineering and science — but also economic, cultural, educational and governmental. Those causal factors figure into the pursuits of the U.S.-Pakistan Centers for Advanced Studies in Energy, called USPCASE. Funded by the United States Agency for International Development, known as USAID, the program partners Arizona State University with the National University of Sciences and Technology, known as NUST, and the University of Engineering and Technology, Peshawar, known as UET-P, two of Pakistan’s leading institutions of higher education. Oregon State University works with ASU to host exchange scholars in the U.S. and to facilitate workshops in Pakistan and partner on joint research projects. 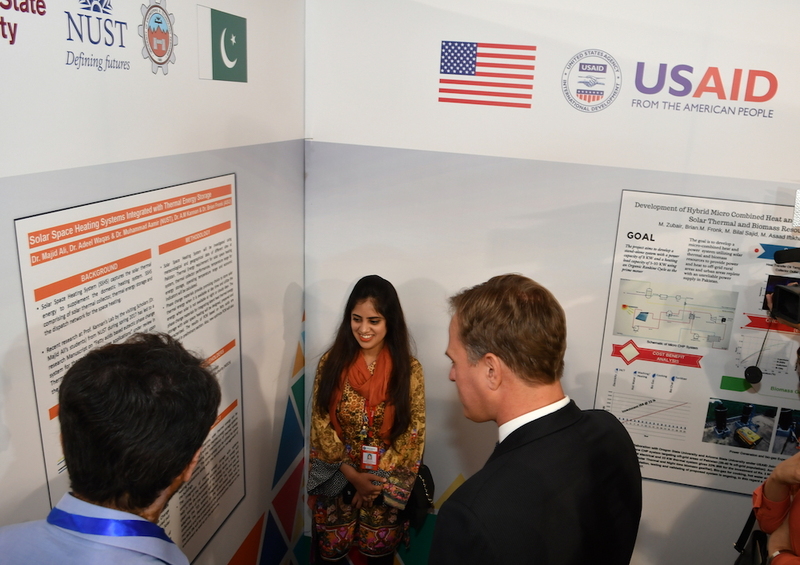 Through the collaborative efforts of researchers at each of the universities, USPCASE is developing multifaceted energy solutions with the potential for global impacts beyond alleviating Pakistan’s severe energy deficiencies. 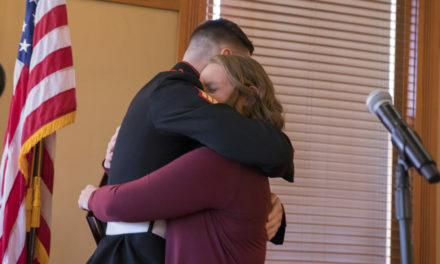 There are five components to the USPCASE project — curriculum, research, student and faculty exchange and scholarships, governance and sustainability. Student researchers with the U.S.-Pakistan Centers for Advanced Studies in Energy, known as USPCASE, install solar panels at a project site in Sakhakot, a village in the Khyber Pakhtunkhwa province of Pakistan, as part of the Hybrid Energy Testbed for Remote Communities joint research project with Arizona State University, Oregon State University and Pakistan’s University of Engineering & Technology Peshawar. Photograph courtesy of USPCASE. Joint research projects pair NUST and UET-P faculty with ASU and OSU faculty. Pakistani faculty benefit from working with faculty from larger and more established research environments and gain skills and experience needed to be competitive in future funding opportunities. As part of the five-year project, USPCASE is to undertake 11 joint research projects, six with NUST and five with UET-P. In addition to joint research projects, USPCASE is facilitating 30 applied research projects in Pakistan, 15 each at NUST and UET-P. NUST is also awarding 10 applied research projects to students with each awardee receiving $5,000 for their project. The applied research projects are funded for 12 months and are focused on finding immediate energy solutions for communities and promoting scientific research in areas relevant to national needs. USPCASE focuses on creating models and methodologies that could lead to establishing robust energy development initiatives. By connecting researchers internationally, USPCASE is encouraging the social and political progress necessary for successful, long-range planning and support in the energy sector. “One of our big ambitions is to provide paths to solutions that can be significant contributions to many countries and to many energy industries,” says Ahmed Sohail Khan, a mechanical engineer and a USPCASE technical advisor and research scientist. Pakistan offers what is in effect a universal testbed for possible remedies to many energy development challenges, Khan explains. The country has about 200 million people living in densely populated areas with an insecure supply of electricity. Many areas endure frequent rolling power outages that can last for 10 hours or more. More than one-quarter of Pakistan’s population have no access to electricity at all, living primarily in rural areas far from the country’s electric grid. USPCASE faculty and students are researching ways to provide access to power in rural areas, while also researching renewable sources and energy efficiency. The energy inefficiencies also raise production costs for many industries, making them less competitive in the international marketplace and dragging down the national economy “through billions of dollars’ worth of lost productivity,” he adds. Khan says the situation is made more frustrating by mismanagement and a lack of political leadership to take on the hard work to develop and put in place a comprehensive energy policy. Through both its research and education components, USPCASE is laying the groundwork for developing a comprehensive energy policy. Joint research projects span a range of focal points, including power systems, electric power grids, solar energy and related photovoltaic technologies, thermal energy, micro-hydro hybrid systems and energy materials. There are also studies on energy policy, economic management and energy security. 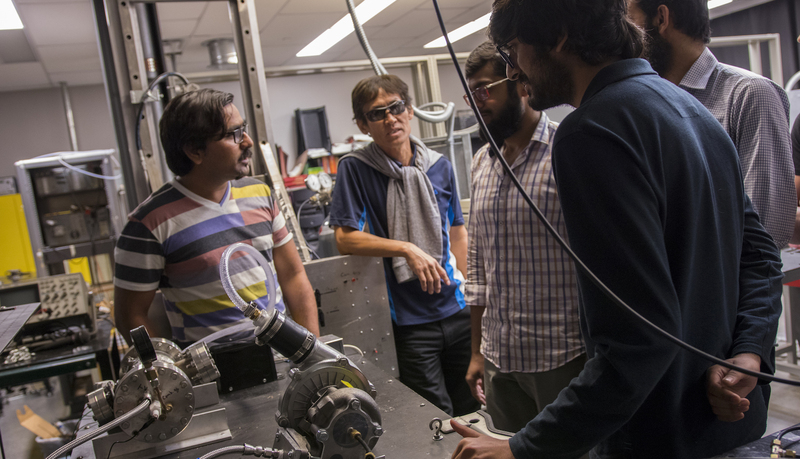 ASU’s Photovoltaic Reliability Lab, led by Govindasamy Tamizhmani, an associate research professor in the Ira A. Fulton Schools of Engineering, is partnering on three projects. With collaborators Muhammad Shoaib Khalid, the principal investigator, and co-principal investigator Abdul Basit at UET-P, one of the projects focuses on the joint design, development and implementation of a hybrid microgrid system for rural communities in Pakistan. 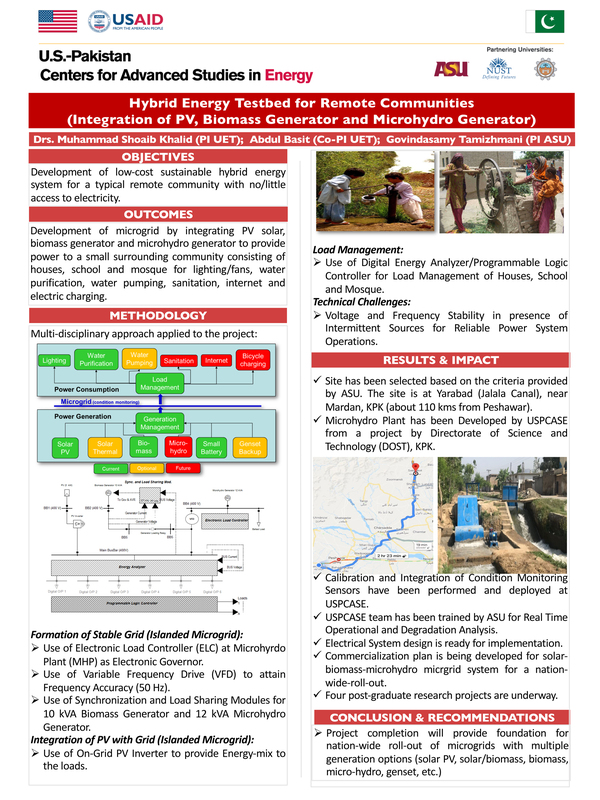 The goal is to showcase a real-world concept of a hybrid microgrid application, integrating hydro, biomass and solar photovoltaic energy sources into a community-level electricity distribution network. 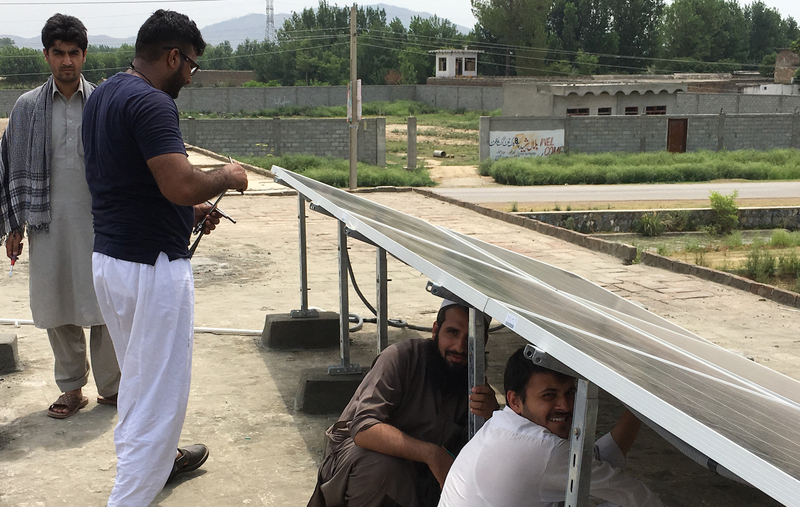 UET-P is using a remote village in Northern Pakistan as the test site for the project, one of the many small communities in Pakistan without access to the country’s primary electric grid. Microgrids are self-contained energy generation, transmission and storage systems that can operate independently from the primary power grid. Tamizhmani says the ultimate objective is to put hybrid microgrids to use in rural communities throughout Pakistan to provide reliable and clean energy in the hope of achieving long-term positive impacts on remote communities. These microgrids can provide power to a small surrounding community consisting of houses, a school, a community center and a mosque, for lighting, fans, water purification, water pumping, sanitation, internet and electric charging. According to Khan, the hybrid microgrids project is gaining traction with government agencies seeking solutions to the widespread energy shortages in large rural regions in Pakistan known as Federally Administered Tribal Areas. Government leaders overseeing one of the most prominent of the FATA regions have initiated an extensive pilot project with UET-P to install the new hybrid microgrids throughout that region to test their effectiveness. 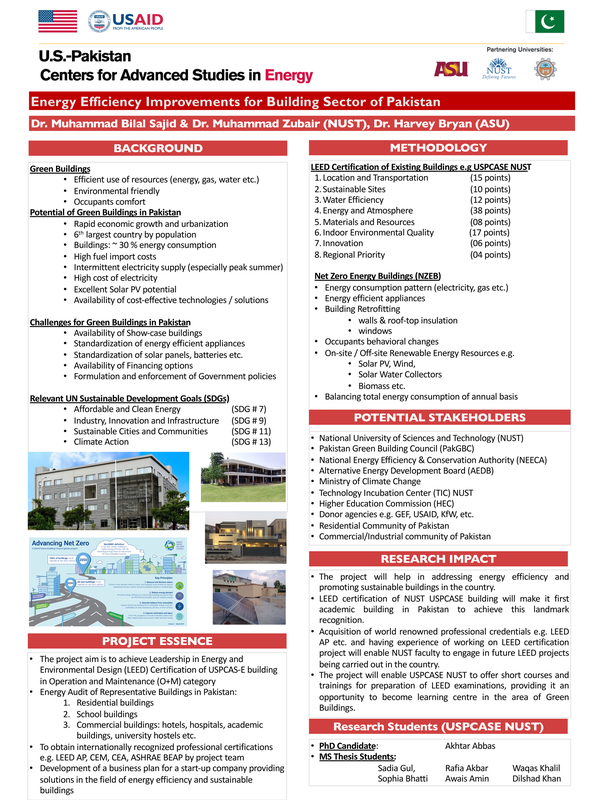 A second joint project Tamizhmani is undertaking with NUST and OSU focuses on the simulation and development of a microgrid testbed to serve as the benchmark for the design of a “smart” microgrid that employs a monitoring system to ensure all components of the technology are operating at maximum efficiency. Tamizhmani’s third project with Saim Saher from UET-P aims to develop an anti-soiling coating with dust repellant properties to improve the solar power transmittance and output of photovoltaic modules, which convert sunlight into electricity, installed at Pakistan’s Quaid-e-Azam Solar Power plant and other solar plants. For this project, researchers will collect and analyze dust samples from the exposed surfaces of photovoltaic panels, develop anti-soiling coating and test the new coating and the performance of photovoltaic panels to which the coating has been applied. 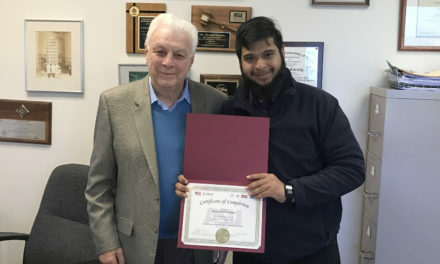 Bertan Bakkaloglu, a Fulton Schools professor of electrical engineering, is collaborating with NUST faculty member Khawaja Arsalan to develop highly accurate, rapid ways to detect aging and degradation in large-scale lithium-ion batteries, which are becoming an essential component in high-capacity residential energy storage, electric vehicles and power supplies. Battery lifespan monitoring methods are critical to reducing the cost of battery replacement. The project goal is to develop hardware and firmware that will self-test batteries, obtaining information on the condition and performance of various kinds of battery chemistries. Professor Clark Miller, an associate director of ASU’s School for the Future of Innovation in Society, is the principal investigator on two projects — one with NUST faculty members Kafait Ullah and Kashif Imran, and one with UET-P faculty member Irfan Mohammad. The goal of both projects is to provide Pakistan with national energy system modeling strategies and to develop a team to help alleviate poverty in the major Pakistan province of Khyber Pakhtunkhwa through access to energy. The latter effort combines hydrological and social research to improve the impact of distributed energy on sustainable development. Harvey Bryan, a professor of design in ASU’s Herberger Institute of Design and the Arts, is collaborating on a project with NUST faculty members Muhammad Bilal Sajid and Muhammad Zubair to erect a “green building” on its campus that adheres to the stringent energy-efficiency and sustainability rating and certification standards for such structures in the United States. The building would serve as a model green building for other institutions and developers in Pakistan to emulate, Bryan says. 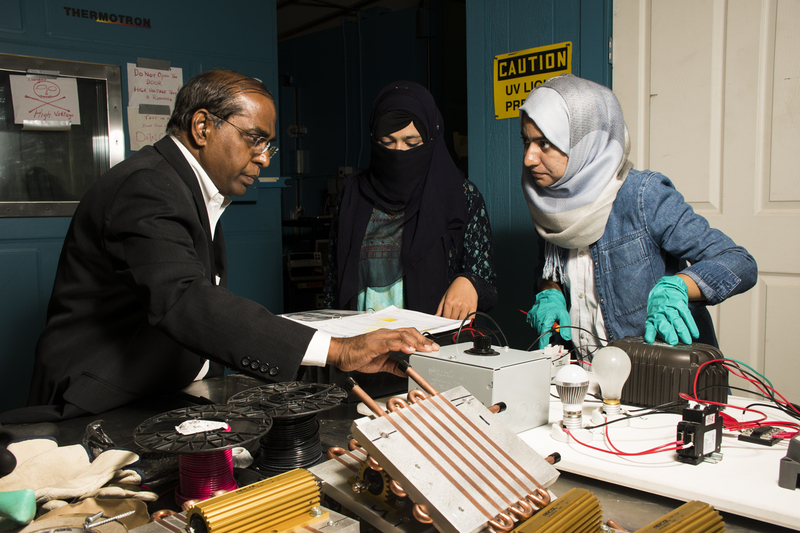 Fulton Schools Professor Arunachala Mada Kannan worked with NUST faculty members Majid Ali and Muhammad Aamir and OSU faculty member Brian Fronk on a solar- power space-heating system involving a solar thermal collector, thermal energy storage unit and a radiator heat exchanger. In the system, a heat transfer fluid carries harvested thermal energy from the solar thermal collector to the thermal energy storage tank during the hours of exposure to the sun. The stored thermal energy is then utilized at night for space-heating applications. Kannan says such collaborative efforts foster interaction that produces benefits through the varied array of expertise that research team members bring to the work. “We always achieve a synergy that results in something better than what we could accomplish alone,” he says. Equally as valuable, joint research projects lead to other kinds of collaborations, particularly co-authoring papers for publication in research journals and generating ideas for innovative approaches to future research, Kannan adds. The collaborations are also providing ASU, NUST and UET-P graduate students valuable experience in advanced multidisciplinary research. It is an especially sought-after opportunity among students at the Pakistani universities who typically are given little hands-on training in research labs in their country. In most USPCASE research collaborations, students “are developing classical mathematical models and implementing the theory into practice,” says Edward William, a technical advisor and research scientist for the program. Some of the students assisting on USPCASE projects also receive funding to cultivate new ideas and are being provided sources of data and technologies to support their lab work, William says. In addition to joint research project visits, USPCASE has a visiting scholar program at ASU each semester for both Pakistani graduate students and faculty members. They get research training in one of eight labs on ASU’s Tempe and Polytechnic campuses that focus on energy policy, energy materials, power systems, power electronics, fuel cells and batteries, photovoltaics reliability and thermal energy. So far, more than 135 NUST and UET-P graduate students and faculty have completed semester-long exchange programs enabling them to study at ASU and participate in research. ASU and OSU faculty members also visit the Pakistan universities to work on joint research projects. More than 200 students and faculty are expected to participate in the research and cultural exchanges over the life of USPCASE project. Even more faculty and students benefit from a series of research workshops held in Pakistan that are facilitated by ASU faculty and international experts. The exchange students also benefit from the USPCASE program’s professional development instruction, which includes studies in policy and entrepreneurship to prepare students to be Pakistan’s future leaders in energy development efforts. One of the most important impacts of partnering with a research university of ASU’s stature and capabilities are the connections this relationship is helping to build between government, industry and university researchers in Pakistan, says Ahmed Khan. “Industry is now coming to us. 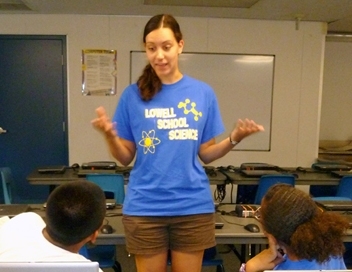 They are interested in our laboratories and the energy possibilities we are exploring,” he says. “We are taking some important steps forward on technologies and power systems,” says Khan, adding that many of Pakistan’s government and industry leaders are recognizing the goals of USPCASE endeavors as critical to the country’s social and economic stability. “It gives us hope of being able to sustain our research projects and of getting the support to stand on our own in the future,” Khan says. Jake Kupiec (jake@asu.edu), USPCASE communications director, contributed to this article.